Marmalade is something that you have for breakfast. I'd never considered it as a cereal flavour until seeing this packet on the shelves. The main reason for this is that citrus fruits and milk don't historically work well together - ever seen Orange Flavoured milkshake for sale? I expected that the milk would go wrong and didn't put too much on the first time. 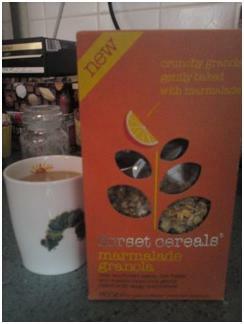 This was a mistake - while the orange does come off into the milk it just mingles as a flavour and doesn't curdle. The very orangey milk (I ate it quite slowly as well) wasn't that appetising and put me off coming back for more for a while. Due to the breakfast review season I decided to give this another go and used far more milk. This made the flavour much more diluted and gave a hint of orange to the icy freshness which was really quite pleasant. Dorset Cereals do a good granola and the cereal part of things is great with a wide mix of seeds and berries and as their really fabulous boxes proclaim 'no dust!'. Again I chose this to eat as it didn't contain raisins and while it was less of a muesli experience than their Fantastically Fruity Muesli from last week it was a very different cereal and may be one for someone more used to marmalade on toast. And you could easily eat this as a light lunch to annoy Johnny Vaughan - as in the Belvita breakfast biscuits TV advert he suggests that the most unlikely thing in the world would be to eat marmalade for lunch. I'm not sure what I was expecting but this is just really nice orange juice. I think all the fun smoothies skewed my expectations of what would be inside an innocent package. 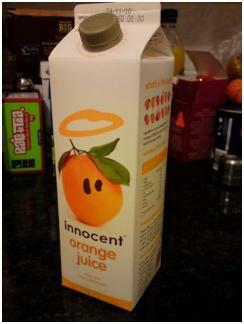 Yup - the pretty box was the only difference between innocent and regular OJ. It was decent OJ and worth the price I paid, but it was still just regular OJ at the end of the day. I like their smoothies & blends though.